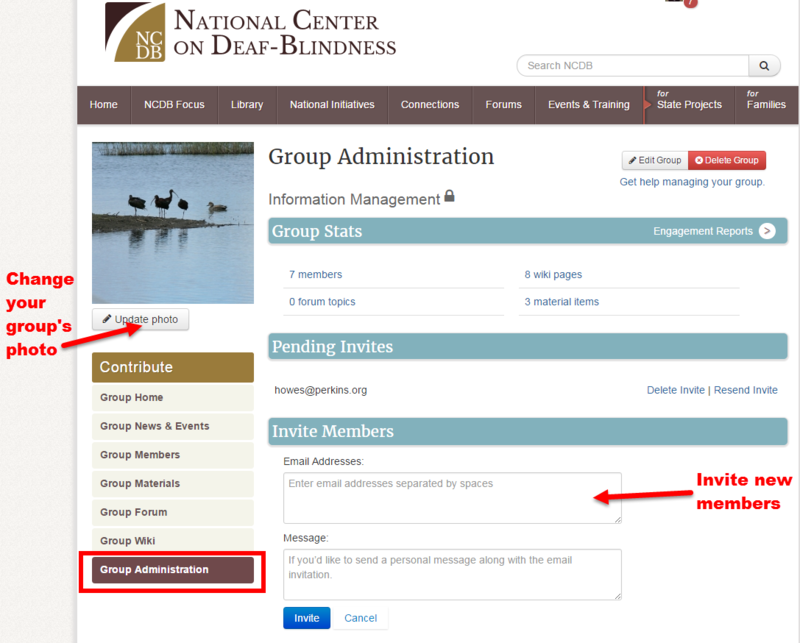 If you are a group owner, you will see an additional button in the group menu on the left side of the page labeled Group Administration. Clicking on this will take you to a page where you can view your group statistics, invite new members, and edit your group. On the Group Administration page under the Invite Members bar, enter the email addresses of the people you wish to invite to the group. You can also write a short message. Click Invite. The recipients will get an email with a link to the group. When they click that link, they will be added to the group. Under the Pending Invites bar, you can see a list of people who have not yet responded to your invitation. On the Group Administration page, click the Update photo button. A dialog box will appear. Click Add file. Another dialog box will appear where you can select an image from your computer. Once you’ve done this, click Open, and the image will upload. As well as displaying on the Group Administration page, the image will appear next to the group name in the Connections section of the site and in members’ profiles. Look for existing “energy” and interest in the field related to the topic. Know if your group is oriented towards interest, action, or practice. Clearly articulate the purpose/vision of the group. Successful groups work from the needs and interests of the members and it is helpful to work with core members to define this focus. A visible, clear, and concise statement makes it apparent how new members who may join can contribute. A statement on the group’s homepage is a good way to convey the group’s mission and purpose. Over time this may be revisited to determine whether it still reflects the intent of the group or if it needs to be updated. Identify key partners and ask them to contribute. Part of facilitation involves cultivating contribution and leadership from within the group’s ranks. You may consider asking a core member to facilitate a discussion, lead a webinar, or look for new members to contribute to the group’s mission. Identifying leaders will help keep the conversation going. Obtain and build content that members want. Group members gravitate toward content that gives them what they need to do their jobs better, to make their jobs easier, etc. Existing content can be used to promote dialogue, discuss implementation, and create new content. Have a plan to sustain ongoing interest and dialogue. You may want to map out monthly and weekly activities to generate interest and foster engagement, including regularly occurring, synchronous events that can be used to add value and create an expectation among members of ongoing, consistent learning opportunities. Celebrate member achievements. Look for opportunities to highlight and celebrate achievements of members and/or member organizations. Ask them to share what they are doing by writing a forum post or conducting a web conference. Embrace and start conversations around issues that have not reached consensus. Facilitators can add value to groups by identifying issues that are unresolved or complicated and then asking the group to contribute their thoughts. Document and celebrate group accomplishments. For more information read this short publication Facilitating Online Communities of Practice from Education Northwest.